SM North Edsa will give you more reasons to have fun with family and friends this coming Easter Sunday! 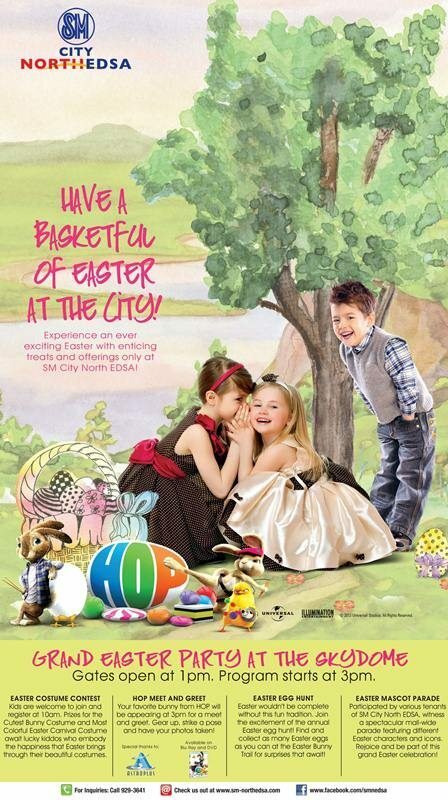 Kids will jump for joy and have a blast in GRAND EASTER PARTY at SM North EDSA SKYDOME on March 31, 2013. Gates will open at 1:00 pm for the Easter activities, join the Easter Mascot Parade at 2:30 pm, and participate in the HOP Race and a giant bubble show at 3:00 pm. Get a chance to Meet & Greet our favorite Hop Character, register and come in your cutest Easter costume, and join the excitement on SM North EDSA’s annual Easter Egg Hunt at the Skydome.